Pomegranate Stick by Farah Aliyeva. 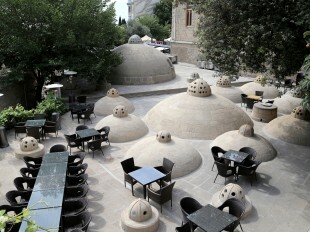 Baku. 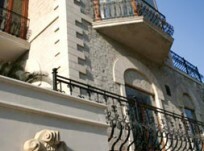 Located right in the heart of Icherisheher, the Nur Art House gallery was created in 2016 by Professor Roya Taghiyeva and aims to present both traditional and contemporary Azerbaijani art as fully and interestingly as possible, and also to introduce Baku residents and visitors to the city to new art trends and, of course, artists. 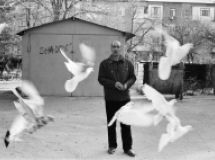 Split between two floors with a permanent collection on the first floor and a temporary collection on the second floor, the Nur Art House gallery has become a hotbed for many exhibitions of local and foreign artists. 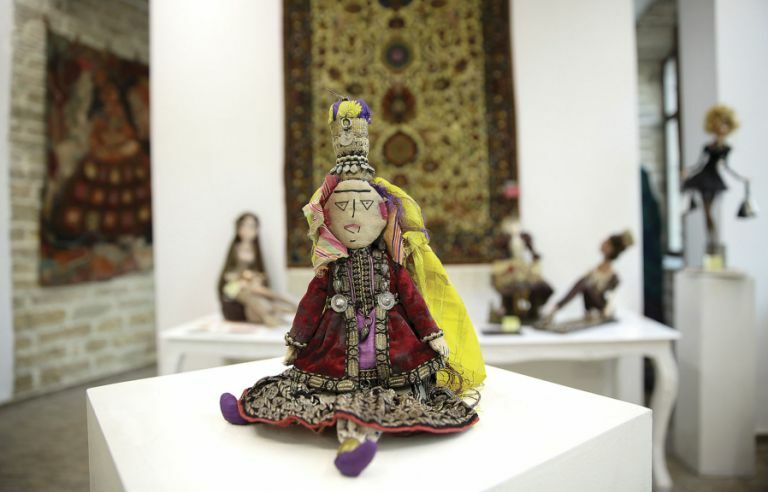 One of these was the recent exhibition of dolls, called Gəlinciyim, Gerçəkliyim, Gələcəyim (My Doll, My Present, My Future), held from 7-21 April and jointly organized by the Azerbaijan State University of Culture and Arts and the Nur Art House gallery. 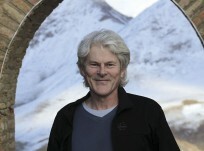 On a recent visit, I felt as if I were in a fairy tale with a wide variety of figures and forms from national folklore. 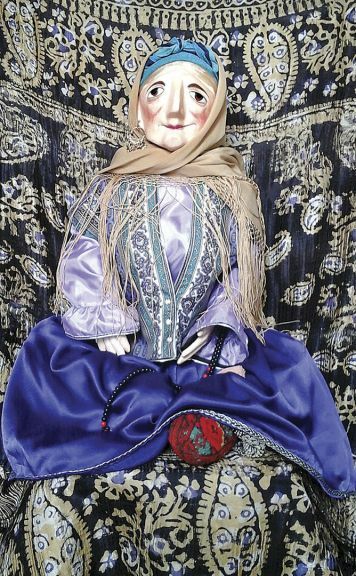 Along with works of contemporary doll makers, there was also a 19th century antique doll from a private collection, reflecting the forgotten tradition of doll making and its revival in Azerbaijan. 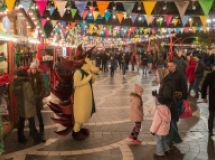 Besides dolls dressed in costumes from the different regions of Azerbaijan were famous fairy tale characters, symbolic figures of spring, biblical and contemporary characters. 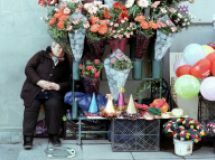 All the works, by talented artists Farah Aliyeva, Ulkar Hajiyeva, Sanubar Samedova, Aibeniz Yusubova, Nigar Babayeva and Gulbeniz Gambarova, had been executed with such subtlety and sophistication that visitors could easily recognize many familiar faces of folk art. 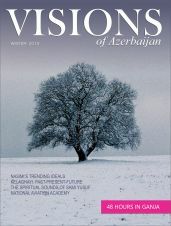 Dolls have a rich history in Azerbaijan. From the beginning of the 4th millennium BC, fear of the forces of nature drove people to use puppets to express feelings and emotions, and then taste and desires. They became an integral part of our lives and have accompanied us throughout history. In ancient times, in childhood, everyday life and religious rituals, objects were endowed with a special quality, whether personifying the mystery of nature, or simply depicting a person. People worshipped these figures and perceived them as idols. As a result of the emergence and rapid spread of new religions, these figures lost their significance and became entertainment. 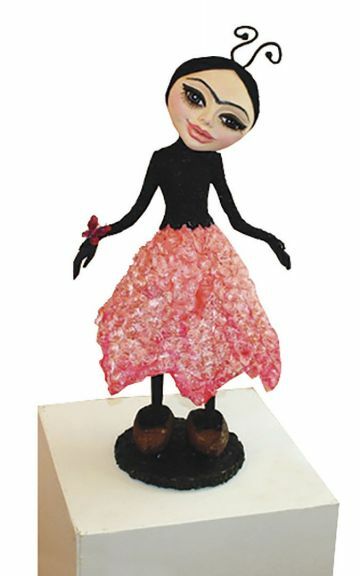 Dolls made of various materials: wood, clay, bone, leather and subsequently metal, paper, fabric at the initial stage of society’s development, as well as in subsequent periods, reflected people’s lives and economy. 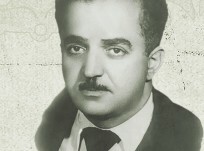 For example, the oldest exhibit and the signature figure at the exhibition was the doll gəlincik. Made at the beginning of the 19th century, this was the doll that young women took with them when they moved to their husband’s house. 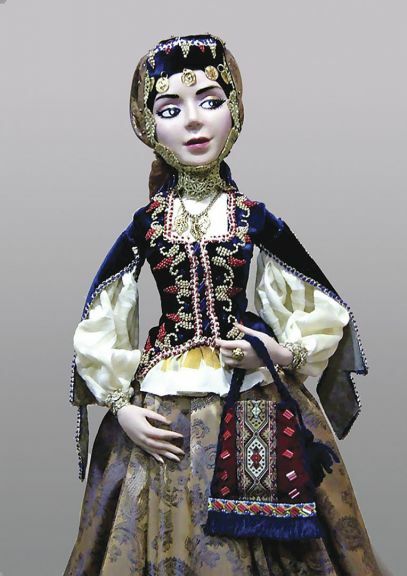 Gəlinciklər were handmade dolls, many of them made especially for brides, hence the name Gəlincik (‘gəlin’ means ‘bride’ in Azerbaijani). They were made by the brides’ mothers and grandmothers and passed down from generation to generation. By taking this gəlincik with her, the bride believed that it would bring her happiness and good luck in her husband’s house. 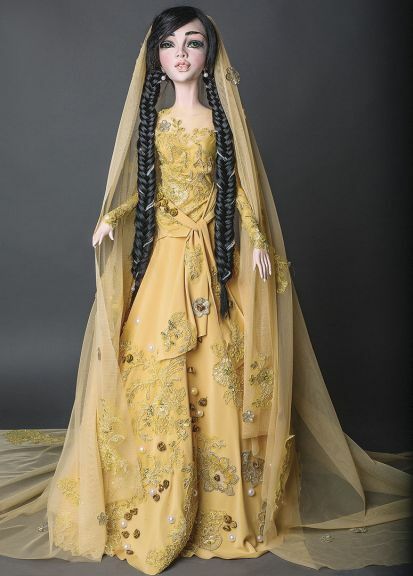 The modern dolls exhibited at the Nur Art House gallery revived the traditions of the past and kept their relevance today. The doll is a national determinant of belonging to any nation, part of our culture which we want to preserve as a memory. This is the preservation of cultural diversity, the preservation of the values that we have maintained, said Roya Taghiyeva. It’s a memory that lifts our spirits, a memory that unites us, that makes us better. The purpose of this exhibition is to recreate and preserve that value, the spirituality that was invested in the making of these dolls, the feelings and spiritual warmth that the author felt while making these dolls. 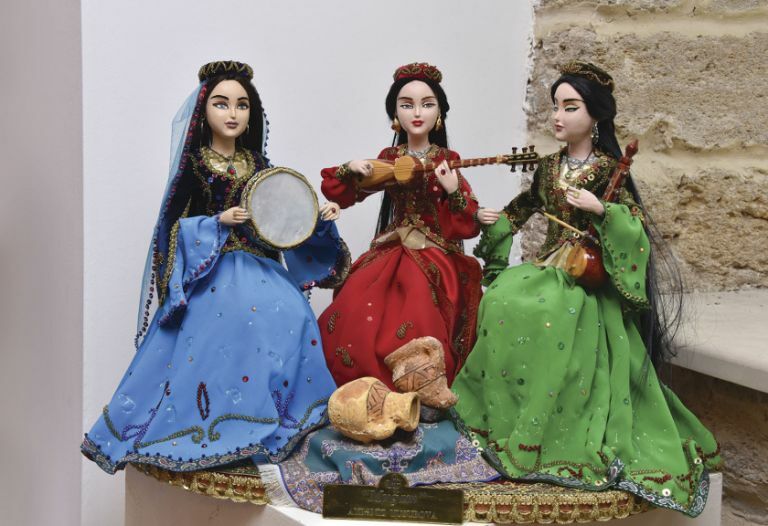 Works reflecting the taste of Azerbaijani beauties, their manner of dress and way of life, reflected various events that occupy an important place in our lives: an old woman doll surrounded by dolls of girls in national costume seemed to be talking about the past. Visitors could also contemplate the girl dolls standing in the centre, dressed in modern, flirtatious clothes and looking at a young betrothed girl at a Xınayaxtı ceremony (henna party), spending her last day at her father’s home before beginning her life in a new family the next day. 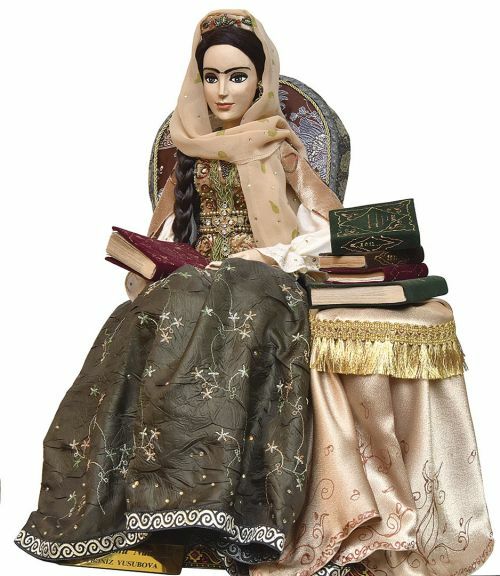 Dolls in the regional dress of Baku, Nakhchivan, Sheki, Qabala, (Inji; Sari Gelin; Khurshudbanu Natavan; The Girl that Weaves Carpets; Mugham; The Princess; The Reading Angel; Eastern Beauty; The Countess; Melancholy) spoke of the culture of our people and the history of this rich clothing which dates to the beginning of the 19th century. They were made from polymer clay, natural silk, velvet, satin and decorated with national ornaments made from threads, pearls and beads and using an ancient folk art sewing technique. Every nation has its own traditions and national holidays. 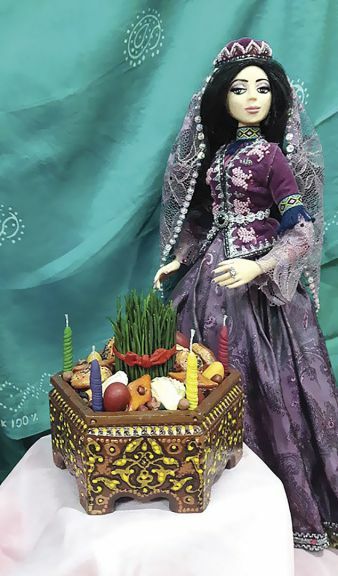 The symbol of the Azerbaijani national holiday of Novruz - a model of a small khoncha – would have been a pleasant memory for both Azerbaijanis and tourists. The paintings The Girl with a Deer, A Thousand and One Nights, Khosrov and Shirin, Momine Khatun, Flower Composition and Miniature were sewn artistically in a mixture of techniques by two artists, twin sisters Aibeniz Yusubova and Gulbeniz Gambarova. Dolls of different sizes made in art nouveau style, one more beautiful than the other, with a great sense of colour differed in features and elegance - Eden, Goddess of the Woods, Maiden Tower, Sari Gelin, Pomegranate Girl, Eastern Dreams, Angel of Heaven, Pomegranate Stick, Inspiration, Bazarliq, Proud Khazar, Bahar, Novruz, The Fisherman’s Girl, Acquaintance. 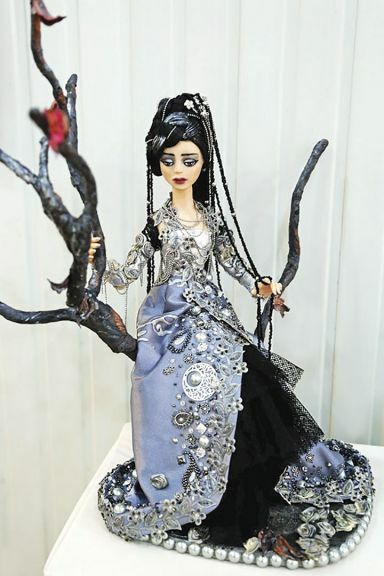 Their creator was Farah Aliyeva, a member of the Union of Artists of Azerbaijan and the International Doll Makers Association, who was presenting a small part of her works. Her character Tiq-tiq khanim especially drew my attention, recalling the tale of Abdullah Shaig about the beetle Tiq-tiq khanim. The doll in its appearance and clothes fully corresponded to this character; the same playfulness inherent in the heroine of the fairy tale is felt in her guise: her long eyelashes, a skirt of flowers, a bracelet in the form of a butterfly underscore her flirtatious image. A nearby character was Jirtdan, a cheerful Tom Thumb. When you look at this mischievous little boy, standing out with his national character, you could see his inner courage and bravery, just as they were described in the fairy tale. And the most interesting doll from the point of view of folk art, in my opinion, was the figure of the grandmother-doll Nənə, happily placing a pair of slippers on a carpet, laid out under a chest. Creating this image, it was as if the author had transferred it from a real person, reminding each of us of something native as well as memories of the happy days of our childhood. 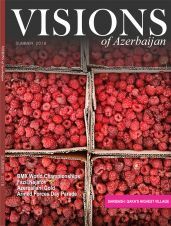 Looking at her face, the elements of her clothes and the prayer beads she kept in her hands, I also recalled the image of the Mother-in-law, the eponymous heroine of the popular Azerbaijani film Gainana. The collection of dolls presented under the title Traditions and Modernity, created by Sanubar Samedova, a member of the Union of Artists, was the leitmotif of the entire collection. Looking at the artist’s works, which she made from wood, animating them in such a way that their facial expressions and clothes were consistent with each other and seemed to tell their own story. Paper dolls by the animation film director Elchin Hami Akhundov from the series Arşın Mal Alan (The Cloth Peddlar), O Olmasın, Bu Olsun (If Not That One, Then This One), Snow White and the Seven Dwarfs and Novruz seemed to be talking to each other. These interactive dolls, a figment of the artist’s imagination, reminded and immersed viewers in the past. Looking at the amazing heroes of Uzeyir bey Hajibeyov, you could almost hear the voices of Gulchohra and Asker, recall the cheerful arguments of Telli and Veli, hear the humorous conversations of Khala and Soltan, witness Asya’s airs and graces and Suleiman’s wisdom. Also among the exhibits were national costumes belonging to the collector Bakhtiyar Bakhshaliev, souvenirs of the 18th-19th centuries: the araqçinlar (a type of traditional cap), arxalıqlar (a traditional jacket), kəmərlər (belts), hörükqabı (traditional head dress for women to hide their plaits), çuxalar (woollen coats), corab (socks), süfrə (tablecloth) and other items attracted attention with their gentle, accurate patterns and sewing. 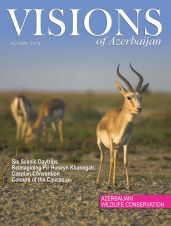 The section on national clothes continued with the collection of Professor Sabira Dunyamaliyeva, whose restored samples of men’s and women’s national clothing echoed the dolls and embodied the transformation of national ornamentation from carpets to clothing. Another original collection of national clothes, dating from the 18th-19th centuries, with their elegant and exquisite fabric and tasteful work, gave the exhibition a mysterious beauty. The collection was created by Ruslan Huseynov, a graduate of the Prince School of the Traditional Royal Arts Centre, and Fuad Jabrailov, a graduate of Baku State University’s Faculty of Geography and Tourism. This talented young duo, as well as collecting more than 3,500 items of national clothes, sewing samples, head coverings and fabrics of museum significance, have also been researching their history and use for over 10 years. Kelagayis are an integral part of our national dress and nowadays carry the traditions of the past, giving it new shades and forms of expression. They were presented at the exhibition by respected academician Rena Ibragimbekova along with visual material from the Silk Museum in Basqal, which demonstrated all the stages of kelagayi production, as well as their different uses and modern interpretation. Having touched the history of folk art, the doll has always served as a means of people’s education and development and carried the warmth of human hands. 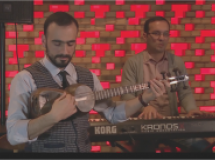 Many national traditions of our ancestors are forgotten but these artists’ works have helped to increase interest in Azerbaijani folk culture and returned us to its origins. 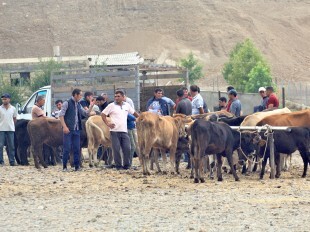 Visitors to the exhibition were able to learn the traditional techniques of doll making and ancient national clothing, as well as to master the basic skills of applied art. As for me, having visited this exhibition, I felt something warm, something native, and these feelings took me to my distant past - my childhood.